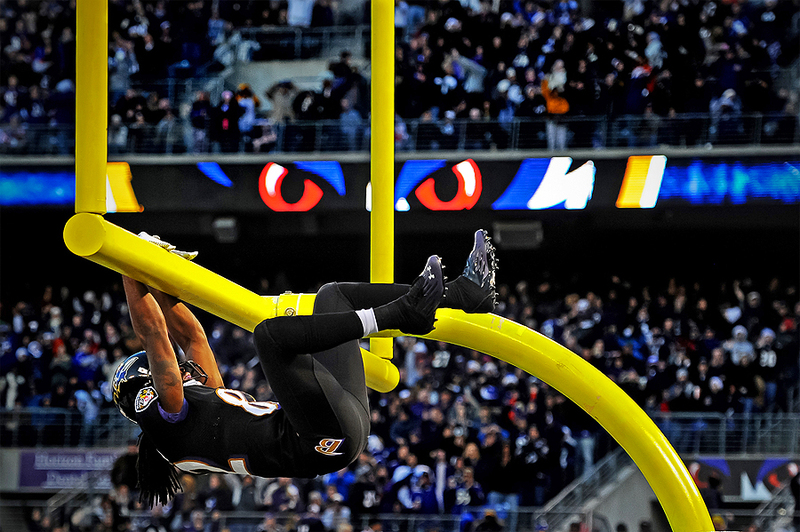 "Wide receiver Torrey Smith #82 of the Baltimore Ravens hangs on the goal post after catching a touchdown pass during the first quarter against the New York Giants at M&T Bank Stadium on December 23, 2012 in Baltimore, Maryland." Its been a shaky couple of weeks for the Baltimore Ravens, but hosting the reigning Super Bowl champions is all it took to get back on the path to the playoffs. The Ravens defeated the New York Giants, 33-14. Shooting the game for Getty Images, the Ravens came out firing on all cylinders. Their first touchdown from Torrey Smith not only gave the Ravens the first strike, but also had me feeling confident about my take. Smith slam-dunked the ball through the goal post and then hung on long enough to guarantee a technical foul if he was a basketball superstar. Much to my displeasure, I only got off a couple frames before my lens decided to stop focusing all together. That's another story in itself, but let's say I learned to manual focus quickly the rest of the game. Its been a fun regular season and I'm looking forward to the playoffs.